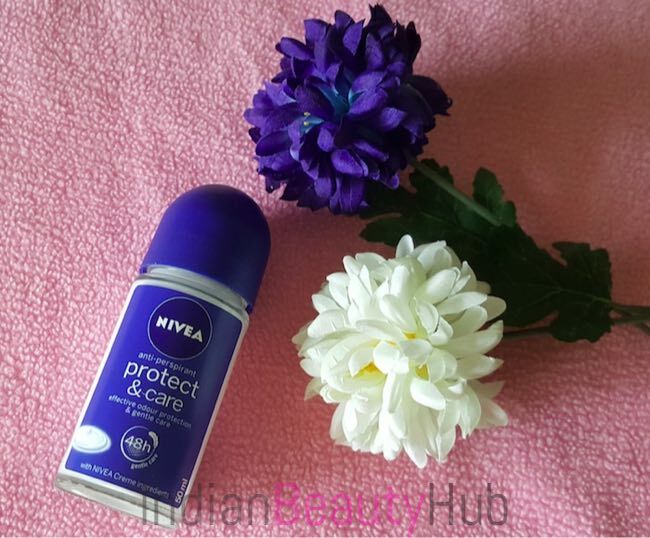 Hey everyone, today I’m reviewing the newly launched Nivea Protect & Care Anti-Perspirant Roll On deo. Being a new mommy I try to use skincare products that are mild and don’t irritate my little angel :) I really like Nivea body care products (especially body lotions and deodorants), as they are very gentle on the skin and have mild soothing fragrance. 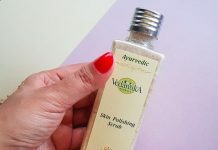 I tried a few Nivea Roll Ons in the past, you can read their reviews here. 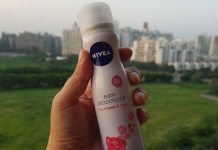 Packaging: Nivea Protect & Care Anti-Perspirant Roll On comes in the trademark “Nivea” packaging, a clear glass bottle with a plastic cap. But this time, they put navy labels on the bottle instead of white. Overall the packaging is sturdy, hygienic to use and can be easily carried along while traveling. 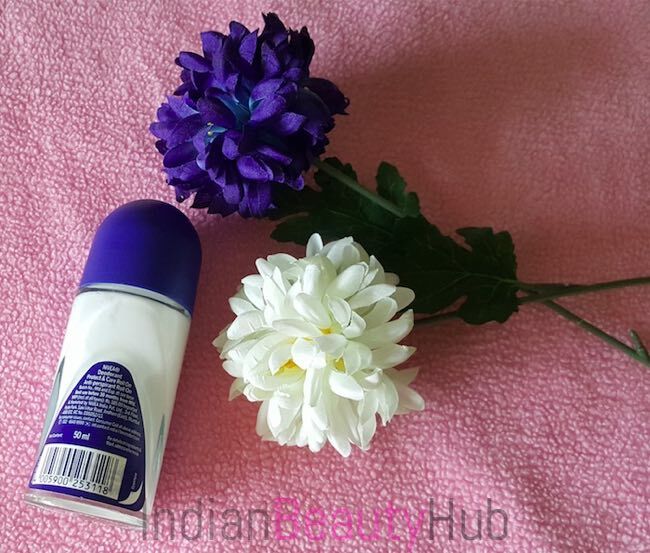 Price & Availability: The price of the Nivea Protect & Care Anti-Perspirant Roll On is Rs.185 for 50ml. It can be easily bought from the local departmental stores and online shopping websites. 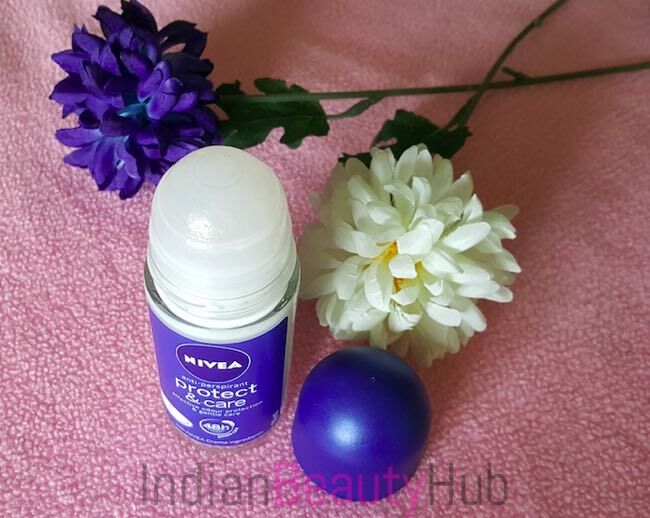 Efficacy: Nivea Protect & Care Anti-Perspirant Roll On comes in a milky white liquid form. It applies easily without giving an uncomfortable sticky feeling. It feels a little wet on application but the wet feeling goes away within a minute. It has very mild, soothing, and pleasant fragrance that stays on throughout the day. The best part of this roll on is, it does not sting like alcohol-based spray deodorants. It neither stings nor irritates my skin. An anti-perspirant deo that controls sweat and prevents odour. It gives non-sticky dry underarms for a longer period of time. It is enriched with the goodness of Nivea Creme ingredients. It doesn’t leave white stains on the clothes. 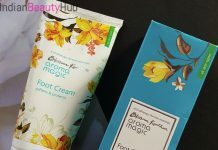 It has a mild fragrance that doesn’t clash with other fragrances like perfumes, mists. etc. I don’t think this would be adequate for someone with a body odor problem. The 48-hour protection claim is not true. 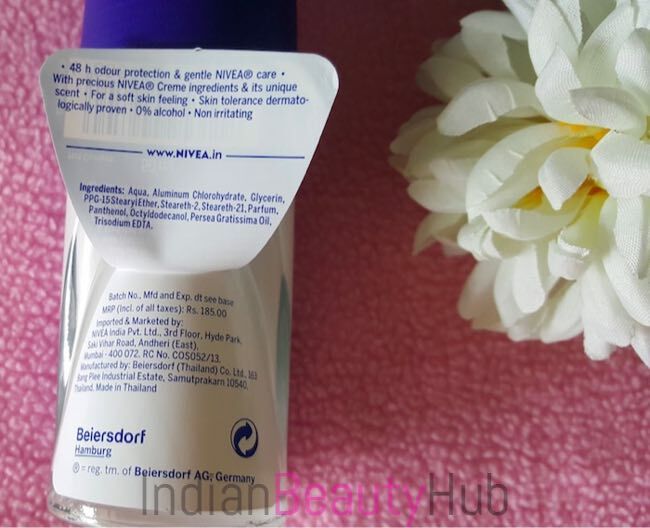 Overall Nivea Protect & Care Anti-Perspirant Roll On is a perfect alcohol-free deo. It soothes irritation, prevents odour and leaves you with a pleasant smelling underarms throughout the day. Highly recommended!